This is a picture of the 2 latest journals , one with a matching Teddy Bear of fall leaf fabric. The pink one has a photo slot to personalize the journal. These items are for the fall craft show that is coming up in our community. The journals sell for six to ten dollars. They have a little pocket inside the cover. The corn candy is my husband's stash and one of his favorites all year round. I am so thankful that he is able to eat pretty much what he wants to. This is a picture of my floor decoration in the living room. The wooden silhouette cat is one that I drew and Bill cut from wood. I know I should paint him black for the season, but I love the rich wood color. The base of the old floor model vintage radio is showing on the right. We were given the radio which also had a record player but nothing worked and it was quiet ruined. So my talented husband saved the bottom portion, refinished it and now I have a 2-door storage compartment. He was able to cut it down still showing the Zenith logo. It now is a stand for our large screen TV in the living room. The little orphan is lively today and we are going to buy the formula for him this morning. He is really strong and wanting to crawl around when I pick him up to feed him. So far, so good. It is always iffy when you try to intervene in nature. I could not leave him on the ground to die. He does not have any injuries from his fall that I can see. Where the ants bit him, it is not red any longer and disappearing. And his tail is filling out with fur. My mother and medical training instincts have kicked in and all I want to do is nurture and set free. We never keep our fish catches, either - ha! ☼ Please note the footnote follow up for Sunday, Thank you! WE LOVE OUR BACKYARD ZOO and this morning while drinking my coffee and watching out of the window, I kept seeing movement in a small pile of leaves. I thought perhaps it was a door mouse or mole making them pop up in the air. I looked through the binoculars and at first thought I was seeing a large mouse. But then I saw a little bold head move and realized it was a baby squirrel. So Bill and I went out to investigate and sure enough it was the dearest little baby squirrel. Bill did not want me to pick him up or anything so we waited to see if a mother from the high nest above would come to retrieve the fallen baby. But no, two squirrels were whipping around the yard burying and un-burying food stuffs in the yard. They completely ignored the baby paying him no mind what so ever. I could'nt stand it! So I went out again and the poor little guy was curled up with ants running all over him. So I took him into the house and and gave him a little nest of tissue and felt wrapping. He took watered down milk from a swab and is happily sleeping LIKE A BABY!! It is legal to keep a wild squirrel but only for 6 months and then you have to let him go. And the pet stores actually sell squirrel formula for babies. This poor little creature may not make it to Sunday, but at least he will know he was rescued by Grandma Kerrie and she did her best. If he were not so small and helpless, I would not have tried to intervene as he might have bitten me and wild animals are always dangerous. I do not recommend trying to care for any small baby creature unless you have knowledge of how to care for them and the legalities involved. But I know all you Mama bloggers will be happy that I rescued this little guy, even for a day and are saying, "Awwww!" As long as I can feel his little heart beat and see his tiny lungs moving air, I will hold him. I have been blessed to be a blessing to others. God didn't say specifically who the "others" are - ha! ☼Sunday update on baby: I bought Pedialyte and have fed the squirrel through the night with a syringe and the liquid. He or she put their little paws right around the syringe this morning and drank. Pictures to come. For information on rescuing and raising orphaned squirrels, go to http://www.stfranciswildlife.org/squirrels.html Just click the link. I need to see his footsteps in the sand. This is a picture of our son who is 45 years old (already!) 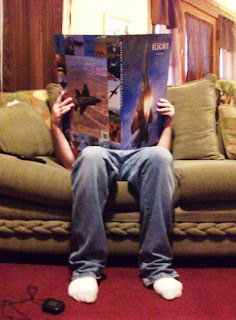 Bill and I bought him this large book that is all about aircraft. He is really interested in the history of WWII and airplanes of any era. The book was too big and heavy to ship so when my cousin visited our hometown, she brought the book to him. His daughter, our granddaughter, Sarah, is studying photography and this is one of her candid shots of her Dad she took for us. It was so much fun to receivethe photo from her and made us smile to see our Dan with this giant book in his lap! Some things never change as we remember him with his nose in books from earliest childhood. How much fun is this?! Everytime I look at this picture, I smile! Thanks, Sarah for your great picture! WHO'S THAT PEEKIN' OUT OF MY BACKDOOR?? It is I, Kerrie - ha! Bill caught me one Saturday when I was still in my night gown and I was bending down to talk to him through the screen. Before I could blink, it was snap, snap and here I am - ha! My cousin Jean lives a few blocks away and always comes in and out through the back door. She says if you come in one and go out the other, you will cause the occupant to have more company. That is funny. But I love it when company comes this way as they feel comfortable and we spend a lot of our days in the den there. My computer is set up in the den so I can watch the birds out of the window and also see Bill if he is working in the yard. I can pound on the window to shoe the geese away and keep the neighborhood in order! Right now the Blue Bird babies from early spring are hanging around and trying to keep any new nests from being built in the Blue Bird House. It seems that the Carolina Wrens have put so much nesting material in the house that their grass, twigs, etc. can be seen in the opening. The baby Blue Birds had a fit and were dive bombing them. The Cardinal had to get into the act and was sitting near and keeping a beady eye on the little Wren who is peeking around the tree. Such goings on! It is too late in the season for a new brood so I am wondering why the Carolina Wren has gone to all this trouble. Oh, dear friends!! I am so much enjoying this blog!! Your comments are priceless and I am so glad you are sharing my sense of humor! Things just strike both Bill and I funny and sometimes not everyone can catch the humor! So it is so much fun to hear from you all. I have published all of your comments but they are not showing as yet and you know I am not a patient person! If I could wish something for every one of you, it would be a good marriage and partner in life. Even with Bill's cancer hovering over us 24/7, he has never lost his sense of humor and we laugh about something every day. Bill was 6 foot tall before the cancer. The bone collapse in his spine has him now measuring 5'7"--on a good day. One morning he came out as I was making coffee, kissed me and noticed how I do not have to tip toe to return the kiss. He said, "Someday, I will wake up and be this tall" and he raised his hand from the floor about 2 1/2 feet, "and I will be saying 'me-me--me,me,me!" I marvel at his finding humor in all situations. Summer's remnants succumb too soon. To take the center stage. The aroma on the spot. In the color of your leaves. IN THE DARK, WE ARE ALL NINETEEN! Aging is nature's little joke and at my age, she must be hysterical! However, I have learned some little tricks that I would like to share with you. Of course we are told to Eat Healthy and I do. But, I snack with gusto, feeling that every carrot or cellery stick I eat should then be rewarded with ice cream or a chocolate bar. Our appearance matters a lot to most of us at any age. We can buy night creams, age defying toners, moisturizer, mud packs, fruit masks and the home version of a chemical peel. However, washing the face with a gentle soap and following up with good ol' Pond's Cold Cream will probably give you the same results in the long run. As we age, anything that CAN sag, WILL sag. We have gravity to thank for this and short of getting out the staple gun, we cannot escape nature's aging process. So if you wake one morning and your breasts have slipped below your belt line, don't fret. Just buy a good underwire bra with adjustable straps and hoist those straps right up under your chin! This will give you great cleavage that can double as a jar opener. And how about that cellulite? For a short term cure, just wear support hose 24/7. Your legs will feel and look 20 again and tanned to boot! My personal loathing of aging skin is for what I refer to as "turkey or turtle neck." What once was a supple, beautifully toned neck area has rapidly turned into rings and rings of sagging, crepey skin necklaces. But wait! I have the solution, just take a permanent marker in the color of your choice, and add dots along those wrinkles. This will appear that you have just gotten one of those trendy Henna tattoos or the invisible fish line necklaces with beads. For those ugly, fine lip lines, I find the following to be helpful: Mix a small amount of dry wall joint compound with your foundation. Use a popsicle stick to fill in the lines, carefully smoothing out to the corners of your mouth. Let dry and walah! You cannot smile but your lips look terrific! I find aging hair to be most uncooperative. Every day, a few of my hairs jump to their death to get away from the glare of my scalp. I color the gray but it never comes out the same color twice. The blow dryer sends the few remaining strands flying into the wind. There are some advantages to thinning hair, of course. I only need ONE curler for the whole crown! It dries rapidly and I never need to trim as it just breaks off. That's really what that "Red Hat Society" is all about. They are hiding their lack of hair! Aside from the obvious, visible signs of aging, there are still more obstacles to overcome in our "Golden Years." Our hearing goes and we find all of our conversations begin and end with, "huh? ", Huh?." Now that really is small talk! Our aging eyes make us look like we are at a myopic sufferers convention. We squint at medicine bottles, restaurant menu's and the figures in our checkbooks. We now need 100 watt bulbs for our night lights. (Never place this wattage near mirrors as the shock of seeing yourself could be fatal). We tend to trip frequently so bend those little wrinkled knees, pick those feet up high, you can do it! I am hoping you enjoyed my sense of humor and no one is offended. Please do not copy this original post without permission. Thank you. Fall is in the air, the nights are blessedly cooler and everything in the garden is adorned with brilliant colors. This Bradford Pear tree leaf is such a beautiful shade of Autumn! Fall has always been my favorite time of year. My Aunt Babe used to burn leaves she had raked near the curb in front of her house. The aroma that filled the air was delicious to the senses. She would be standing there in her bib apron tending the fire until it was out. Open burning was allowed in the forties. Raking leaves was and still is one of my favorite activities. It's good exercise, it smells good and it brings back memories. Memories like my brother and I making paths through the leaves in our yard, sectioning off rooms or just jumping in the piles. Our hair would be full of their dust and bits of leaves covering our clothing, but oh what fun! Introducing Pooky's Grandma Click on Introducing PG and it will take you to the history this Saturday of the development of the cartoon. If you do not see your comments in the side bar, click on comments made under each post and they will be there. If anyone can teach me how to have them all show in the side bar, I would be so grateful! Wow! 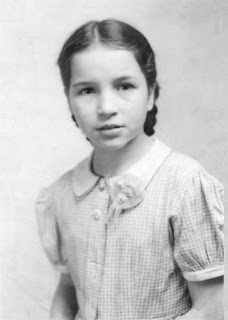 This is my sister Mary at age Ten! My Brother-in-law, her husband, just shared this beautiful picture with me yesterday and I was thrilled! Who watched me grow and all. And picked me up if I should fall. Who to me is better known. A life that has too swiftly flown. That only two sisters can share. September 11, 2009 All rights reserved. Do you have a special memory of a sister you love dearly? I would love to hear about it. Celebrate YOUR sister by writing it here in my comments page. I'll be waiting! I HAVE BECOME MY MOTHER..... I was happily reading Beverly's post at How Sweet the Sound about having a yard sale. It ocurred to me that she has the same problem that so many of us have. Especially if you are a craft person. My Mom had every craft supply imaginable. Stopping by to visit her was like going to the craft store. I never left without instruction books, yarn, a new crochet needle, etc. She loved to share both her knowledge and her supplies. But it made every cupboard, closet, cubby holes and surrounding her chair, the epitomy of clutter and hoarding! She would buy little things like greeting cards and a pack of needles and not be able to find them when the occasion came and went or when she needed the needles and would have to buy more. Later on, she would be checking her chest of drawers for something else and announce, there's that card and needles! They are still in the bag! She lived to be ninety and never changed. I am 32 years younger than my Mother. I showed signs of suffering from this same malady when I was in my thirties. I worry that my children like Beverly's son will be left to deal with all my storage bins, craft supplies, paperwork, photographs, videos, clothes, knick-knacks, etc. I once bought my husband an Easter card about 3 yrs. ago. We have not found it yet. I know that I bought copper tape at the craft store that I desperately needed, came home, put it away. And haven't seen it since. This happens a lot lately. Things that make you go, "hmmm!" I picture the children ordering a long deep dumpster in which to throw boxes and boxes of my legacy! Their friends will ask, did your Mom leave you well off? And the answer will be, "No, she left us crafts and craft supplies." Did she leave you her house?, "No, she left us the shell of a house with a craft store inside." Surely she must have had life insurance! "No, she pre-paid her funeral expenses and left us the paperwork and the urn." How about clothing, she was of small stature, like you? "No, she left some skirts that she wore when she was young and wore a size 6. She was waiting until she could fit into them again." Didn't she leave you anything that you are happy about?? "No, she left me her addiction, want to see my closets, attic, garage?" NO! The above photograph was taken on June 6, 1929 and was my Mother's Wedding Day. Notice the Flapper style dress she is wearing and the bowl hat. I treasure this picture. HAPPY THURSDAY ARLREADY!! I cannot believe that it is nearing the weekend! I have been working on my book and blogs along with the regular mundane duties we housewifes have every day and the time has flown!! I am having trouble getting a hit counter on this blog. I had one and it appears to be gone. Anyone know what to do to solve my problem? I tried to download a new one but it tells me I already have a counter for this blog. Go figure! In researching for my book I have taken pictures of old family photos. My brother has contributed some of the photos to me via e-mail through the years and I treasure them. My father was a health and fitness man who worked out. I love this picture of him in the old timey swimsuit of the twenties. 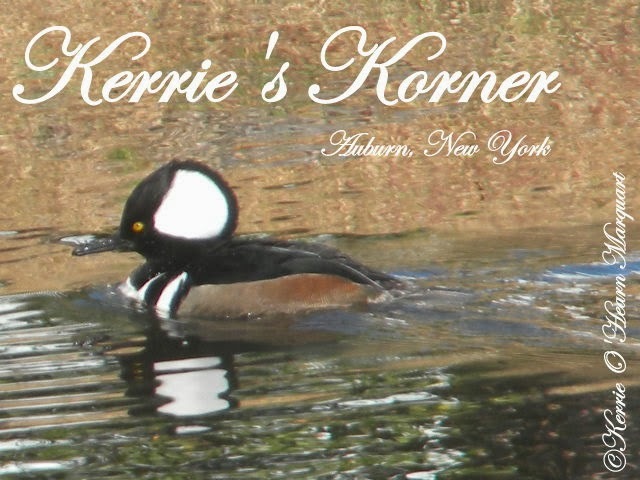 My brother's website is http://www.ohearnshistories.com/ My older sister, Mary Catherine has also provided photos for me as her hobby as a teen and young adult was photography. Without her photos during our childhood, there may not have been any pictues of my brother and myself. She is a young 77 with a wonderful sense of humor. My father had a wonderful sense of humor and I think he passed that gift on to all of his children. Please visit Karen at http://thegraphicsfairy.blogspot.com who is featuring a free charming Paper Doll. This is one of the greatest sites! and sadness still reigns in the faithful heart. Will there ever be a time when God's gifts given will flow? Please answer now, my prayer. GOOD MORNING! Today is the most wonderful sunny day and at long last a breezy, cool day! Just a hint of fall in the air and I was able to open all the windows while working on my blogs. It is hard to concentrate when I cannot stop looking out of the windows! Isabella, the Queen, our ragdoll cat, had her nails clipped this morning, her ears oiled and her face washed. She was completely disgusted with the whole process as hubby held her with heavy garden gloves while I proceeded with the grooming. We also wrap a heavy towel around her so he is able to hold her better. We never want to take the chance of his being scratched as his immune system is compromised with the cancer. However, she survived and was rewarded with a brushing, which she loves and some cat treats. She is resting peacefully now. I have finished about 27 pages of my book and my enthusiasm grows as I see the words in print. My memory of childhood is improving as prompted by the incidents that I am writing. This will be a labor of love and only God knows if it will ever be read by anyone but the children. Yet, I am enjoying the creation no matter the outcome!